Imagine an aqua-blue ocean vista and a salty breeze blowing as you arrive in Barbuda. Barbuda is an incredible island, strung in a larger chain of the Leeward Islands in the northeastern Caribbean. Although it may be small, Barbuda, like so many other islands in the Caribbean, faces big issues. Caribbean-wide, the health of coastal ecosystems and fish populations is declining. On average, 79 percent of Barbuda's reefs are covered in algae, with less than 14 percent living coral. This overgrowth of algae poses threats for fishing and tourism: Fish need a place to live and replenish their populations, while tourists want to see vibrant diversity and abundance of fish. Fishers now have to go further and into deeper water to make a good catch. This is both expensive in fuel and dangerous. "Something has got to be done," says Larkin Webber, an elder Barbudan fisherman. "Things are out of hand where fishing is concerned." Protecting not just Barbuda's but any island's ocean resources is important both for the environment and for the island's livelihood. Coral reefs and mangroves provide a buffer from wave and wind damage from storms. A healthy reef ecosystem is just as important to local culture. The people of Barbuda have a strong connection to the sea. In order to preserve this way of life, ocean ecosystems must be protected. The Waitt Institute has taken on the challenge of helping protect and restore the unique ocean ecosystem in the Caribbean by supporting the Barbuda Blue Halo Initiative. 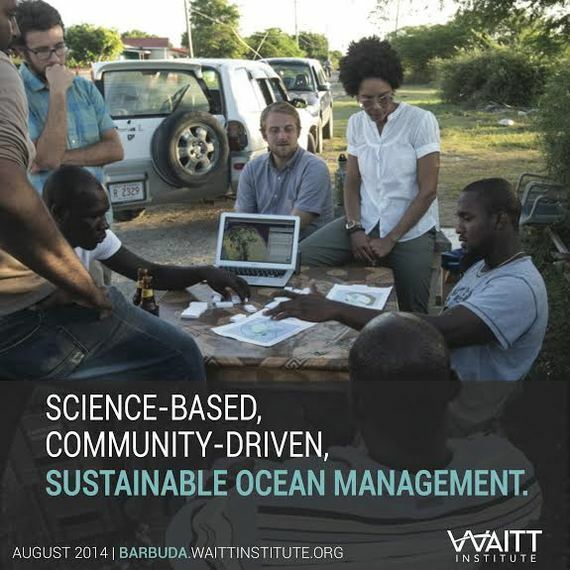 With Barbuda as a pilot project, the Waitt Institute partnered with the local government to empower the community to restore their ocean and secure a sustainable ocean future for this generation and the next. Put simply, they collaborated to design a plan to use the ocean without using it up. Earlier this week the Barbuda Council signed into law a sweeping set of new ocean-management regulations that zone the coastal waters, strengthen fisheries management, and establish a network of marine sanctuaries. The new regulations create five marine sanctuaries, collectively protecting 33 percent (139 square kilometers) of the coastal area, and a two-year moratorium on fishing in the Codrington Lagoon (also the world's largest frigatebird sanctuary) to enable fish populations to rebuild and habitats to recover. In addition, the catch of parrotfish and sea urchins is completely prohibited, as these herbivores are critical to keeping algae levels on reefs low so that coral can thrive. "This will definitely benefit the people of Barbuda, and Antigua as well," said Arthur Nibbs, Chairman of the Barbuda Council and Antigua and Barbuda Minister of Fisheries. "No part of this is meant to hurt fishers. It's the reverse: ensuring that they have a livelihood that will last in perpetuity." Barbuda is the first Caribbean island to put these important, strong measures in place. Although Barbuda may be small, it sets the bar high and is an inspiring role model for other Caribbean islands to make a similar big commitment to a sustainable ocean future.